Privacy and ownership of digital property—like your Instagram posts or Facebook photos—in the age of the internet is a complicated issue, to say the least. And it’s now a problem that extends beyond us humans. Meet Naruto, the crested macaque monkey who became embroiled in a legal battle that lands somewhere between intellectual property and animal rights. If you’re unfamiliar with the case, here’s a brief overview. Years ago, Naruto picked up a camera in Indonesia left unattended by photographer David J. Slater and snapped a few objectively great selfies. Then things got complicated. Slater sold the photos for a profit and claimed that he owned the copyright on the images, despite the fact that Naruto actually took the photos. PETA decided to file a lawsuit “asking the courts to recognize Naruto as the owner of the copyright to the photos,” Justin Marceau wrote for Quartz last year. The latest development in this saga came on Monday after attorneys for Slater and PETA reached a settlement before the case went to the U.S. federal appeals court. Naruto is now entitled to 25 percent of future royalties from the sale of his selfie, Sam Rigby wrote in a different Quartz article. While Naruto will not directly receive the money, PETA says it will ensure it goes to organizations or charities dedicated to protecting his species. 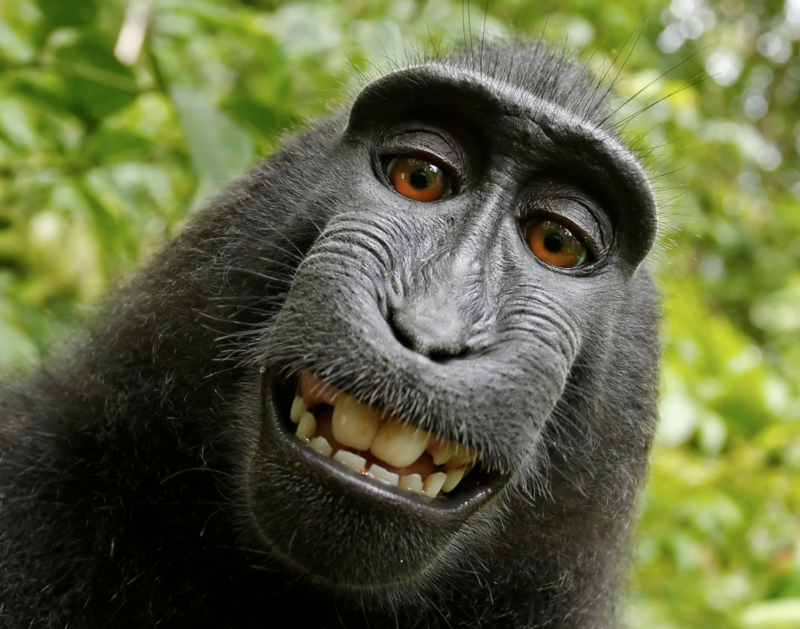 Thanks to research done during the legal battle, PETA successfully argued that “Naruto satisfied the basic requirements for authorship due to the crested macaque monkey’s intelligence, individual personalities, and highly intentional social behavior,” according to Quartz. In a statement about the case, PETA and Slater said “this case raises important, cutting-edge issues about expanding legal rights for non-human animals,” according to the Associated Press. Call the monkey-selfie-situation what you will—bizarre; a sad reflection on humans’ invasion of natural habitats; comedy gold—but the case actually brings up some profound questions regarding copyright and ownership over images, especially in an increasingly connected world where sharing photos and personal information is something we literally do all day long. While this is certainly a unique case, it isn’t the first to bring questions of ownership regarding photos into the public spotlight. In 2005, photographer Philip-Lorca diCorcia was brought to court by a subject in one of his photos, Erno Nussenzweig. diCorcia took photos of people in Times Square in Manhattan without their consent, including Nussenzweig, an Orthodox Jew, whose faith believes photographs violate teachings of the Torah. And at a time where we’re watching children grow up to sue their parents for posting photos of them online when they were kids, the story of Naruto just adds another layer to the ever-confusing intersection of law, technology and property ownership. But in all likelihood, it’s only a matter of time before another strange, selfie-related legal case arrives on the scene. Let’s just hope the next lawsuit is over a selfie as fetching as Naruto’s. Read more about Naruto here.